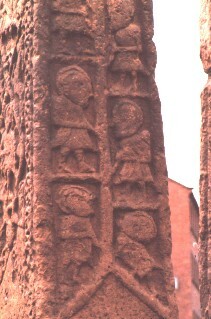 South Cross Shaft, North view. South Cross Shaft, North view. The cross is dated to the mid ninth century. This is the main part of the cross shaft. There are a number of figures on this face. It is suggested that these are the Apostles receiving the Holy Spirit in tongues of flame at Pentecost, New Testament, Acts 2:1.